Dining at the Rive Gauche (in the Hotel Baur au Lac) when the team of Nobuyuki “Nobu” Matsuhisa cooks was a bit of a disappointment. Everything was really tasty but somehow it just didn’t reach a level which I was expecting – when you eat something that you say, wow, this is amazing. Happened just with one of six courses. But it must be said, the dishes are very good. You can find the description of the event in the flyer (download). Unfortunately, it’s in German only but basically explains that the team of Nobuyuki “Nobu” Matsuhisa presents the highlights of the Japanese-Peruvian kitchen. We were not able to choose a menu. 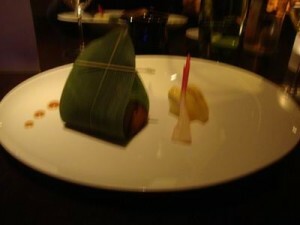 There was only one menu, the Nobu Omakase Menu, and were only asked if you’re alergic to something. You have to choices when it comes to the menu, the regular one for CHF 160.00 per person or the special one with Wagyu beef (for CHF 300.00 per person). We decided to go for the regular one. The first course was “New Style Sashimi Salmon” (Salmon sashimi drizzled with yuzu soy, seared with hot oil of sesame and olive). The salmon tasted great – especially with the yuzu soy on top of it. 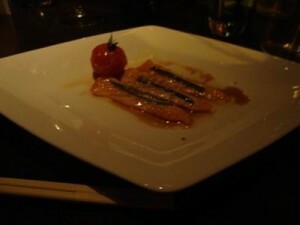 The tomato was to neutralize the taste after the salmon. As a second course we had the “Sashimi Salad Matsuhisa Dressing” (Seared Sashimi, served on green field salad topped with Matsuhisa dressing). While the sashimi was good, the Matsuhisa dressing really made a difference. It was delicious – can’t really describe it, but it was definitely great. The 3rd course was “Black Cod Yuzu Miso Sauce” (Cod Fillet marinated in sweet miso, grilled till perfection, served with yuzu miso and hajikami). The fish fillet was ‘hidden’ in the leave marinated in the same miso sauce you can see as three dots on the plate. The cod was extremly tender, and the marinade was delicious. At the end you were supposed to eat the fresh ginger to neutralize again. 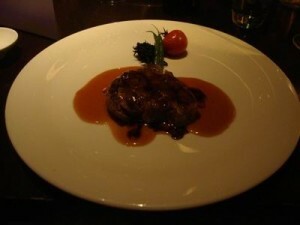 The 4th course was “Beef Fillet with Balsamic Teriyaki Sauce” (Grilled tenderloin of beef with seaweed salad served with aged balsamic and teriyaki sauce). Honestly, this was the only course where I have to say, this was delicious on a level I was expecting. The beef was absolutely tender and rich in taste, the seaweed salad was interesting. As usually – at least so far – seaweed wasn’t my favorite because it had its very own taste, the seaweed salad looked like it was sun-dried and tasted pretty good. 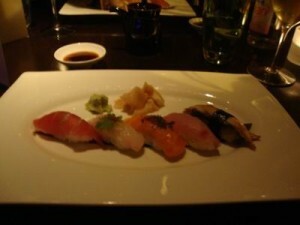 As a fifth course we had “Sushi” (Chef’s selection of premium sushi). Not much to say about it really, as much as I was expecting extraordinary sushi as it was announced as the Chef’s Selection, I must say, I was most disappointed by this course. The sushi was good, had a nice variety but honestly speaking, it wasn’t anything special. 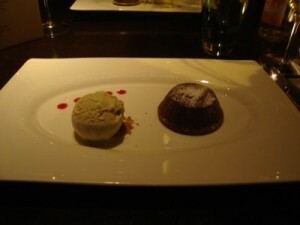 The sixth and last course on the other hand, was much better: “Nobu Style Chocolate Fondant with Matcha Ice Cream” (Self saucing warm chocolate cake, green tea ice cream). The Chocolate Fondant was great – the inner part was still very liquid while the outer was hard to contain the liquid. The green tea ice cream was good too but not any better than other green tea ice cream I’ve had so far. Somehow I get the feeling green tea is not really something you should make ice cream of. All in all, the dishes were very tasty. There is nothing to complain about the overall quality of the food and supposedly, if your expectations aren’t as high as mine were, you would probably be overwhelmed. But honestly speaking it was not revelation for me which disappointed me a bit. The atmosphere in the Rive Gauche is classy and modern. I don’t know if they decorated the restaurant especially for this event Japanese-like but it is really appealing. The service is good – sometimes it takes them a bit long to refill your glasses plus the time between the courses varies massively (from about 2 minutes from course one to course two, up to about 20 minutes from course four to five). The prices are – all in all fair – CHF 7.00 for a double espresso, CHF 8.00 for a bottle of water (0,5 L), CHF 7.00 for a glass of white wine (Grüner Veltliner, Göbelsburger) and CHF 160.00 for the 6-course Nobu menu. CHF 25.00 for 2 CL of Rum Zacapa 23 years is a bit high though – at least it hit us by surprise. If you always wanted to try the kitchen of Nobuyuki “Nobu” Matsuhisa, you should definitely either try to get a table thi year (the event takes place every evening until the 11th of December, 2010) or to get one next year (assuming he’s going to be there again). If you’re just curious, I would probably go to one of the Nobu dependences around the world and try a few things from the menu because the food is really good but it’s just not as amazing as one might think. The Rive Gauche is located between the lake shore and the Paradeplatz. It is therefore easily reachable by public transportation and a little footwalk. There are quite a few places close to the Rive Gauche like the Baur au Lac Bar, the Onyx Bar at Park Hyatt, the Restaurant Mövenpick Palavrion, the La Stanza Bar, or the Restaurant Bauschänzli. 2 Comments on "4. 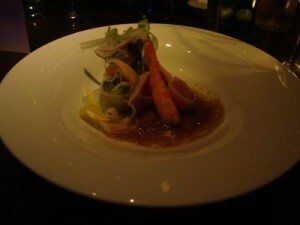 December 2010: Nobuyuki “Nobu” Matsuhisa @Rive Gauche"